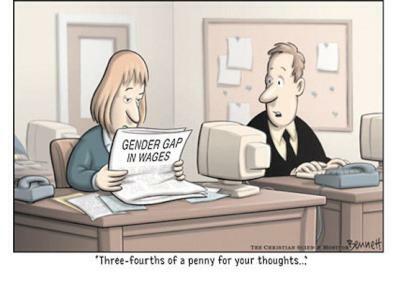 Last Thursday was apparently Equal Pay Day. No, I had no idea either. But apprently it marks the extra days from 1 January that women have to work to earn the same as men did the previous year. What? I may well get shot down in flames here but this is a subject that irritates me greatly. There are lots of reasons why the so called experts believe there is a widening gap between what women and men generally earn. It’s not discrimination. Careeer choices anyone? Late last year, recruitment company Robert Walters published a study on gender discrimination and how it affects professional’s career choices. Now, I have to confess I haven’t read the full report and I’m sure it’s a well researched and written study. What irked me though were the headlines it generated and the issues they focused on. The main thrust of it was that “most Australasian professionals believe gender discrimination still exists in their workplace.” Let’s just think about that sentence for a second. What we are saying here is that people generally feel that decisions are made about appointments, promotions and salaries that use gender as a key driver. Some 75% of those surveyed apparently believed that statement to be true. Further, 55% believe it is more difficult to be successful as a woman and a whopping 48% believe women still receive less pay than their male counterparts. A recent New Zealand government report on tertiary study also apparently confirmed a gender gap in graduate salaries if you believe some of the headlines. Read the report and that little fact barely warrants a mention but people don’t look below the headlines for the underlying reasons do they? The perception is therefore cast that a male graduate doing the same job will be earning slightly more than a female colleague doing the same job. This of course is complete nonsense as any graduate employer will tell you. One of the joys of working in HR is that you get to see what everyone else in the organisation (including your own colleagues) is earning. This isn’t always a joy of course when you realise the idiot manager who couldn’t manage his way out of a paper bag and whose mess you are constantly clearing up earns 20 grand more than you do! If anything, HR people tend to be the poor relations in the corporate world in terms of salary packages. I’m not sure why that is. Maybe we are just paid as a profession relative to our perceived value? But that’s a whole other issue. My point here is that I can’t recall feeling in any organisation I’ve worked in over the last 20 years that there is a gender gap in terms of salaries or gender bias in promotion decisions. When I look at teams of people all doing the same job, whatever the industry or profession, I’ve always seen a fair mix of salaries based on experience and performance and as many women progressing as men. I don’t doubt that in some areas of the workplace there are sexist and discriminatory practices still going on and you do read about them from time to time. But these are “professionals” in the corporate world we are talking about here. Not cleaners, mechanics and car salesmen. The reality as I know it is that females earn the same as males for doing the same job. They have just as much chance of getting promoted as their male colleagues and the only barrier to their own success is their own ambition. To quote my last post, its 2013 not 1973. If it were any different, my job would have a very different focus. Is that too simplistic a view? Does anyone feel I’ve got it badly wrong? If so, tell me. As always, I’m interested in your thoughts. One final thing, (and no apologies for this as it’s my blog and I can include what I like! ), if you have read and enjoyed my posts I would appreciate your indulgence and support. This coming weekend (9/10 March) I am taking part with my wife and daughter in our local Relay for Life. Four years ago my wife was diagnosed with the most aggressive type of breast cancer. She was lucky. She caught it early and survived after a full course of chemo and radiation treatment and thanks to some wonderful support from the staff at Wellington Hospital and the Cancer Society, and also to a drug called Herceptin that was not widely available to people even five years ago. Had we still been under the previous government when she was diagnosed, we would have had to sell the house to afford the treatment. I’m not knocking the politicians here, just pointing out it is a very expensive drug and a lot of research went into it. Relays for Life are wonderful events and raise a lot of money for cancer research while remembering those who weren’t able to beat the disease. Incidentally, we’ll be lighting a candle for my wife’s then company HR Manager who sadly succumbed not long after my wife was diagniosed. It’s obviously something that means a lot to us as a family and is a chance for us to give back. If you can spare a few dollars, pounds, Euros, yen whatever, then please go to the link below and select Relay for Life Kapiti 2013 and choose Compass Kapiti as the team and sponsor me (Richard Westney). We will be walking through the night as part of a team of about a dozen people. Your support in helping fund the ongoing research into this awful disease is appreciated. IMO the pay gap is due to woman taking a career break to raise a family, having to scale back on work for the same or choosing a career that does pay less but perhaps has more appeal to woman. But we do have a choice, it comes down to how the workplace supports that choice. You’re right, there is no conscious decision to pay woman less than men. Good luck with the Relay for Life! My aunt was also diagnosed with an aggressive form of breast cancer. She survived it thanks, in part, to Herceptin. Thanks Amanda. I tend to agree. I also think what people study has an impact too in terms of career choices. There are lots of contributing factors but none of them discriminatory. I agree with your comment Amanda and we have tweeted each other a couple of times on that very issue. So the question becomes why aren’t men playing a greater role in raising children and also making some career trades off if and when needed (as per my post below)? Hmmm… I don’t really know where I sit on this argument Richard. However, when I look at statistics like this http://www.graduatecareers.com.au/Research/GradJobsDollars/BachelorU25/Building/index.htm where under 25 year old graduates entering the building industry have a $5,000 difference in starting salary between genders, I don’t think the ‘lack of ambition’ argument stands up. They’re under 25 and entering their first full time job, how much ambition have these people had the opportunity not to display? I think we don’t see a lot of this because the highest invisibility comes with small employers and family businesses, places that probably don’t even have HR. And that’s why a lot of this news doesn’t feel ‘real’. How will there ever be collective employees making a news item against a well recognised company, when the highest prevalence of this activity happens in the little business down the road. Who cares that little business? Who even understands what their product is? Oh they make belting for bulk conveyancing machinery – what does that even mean?! Anyway, I suppose my point is that yes, your experiences prove your point. But we don’t always know what’s really going on, what we see is just a snippet of the world, especially with economies like Oz & NZ where something like 95% of employers are small businesses. It’s not the stuff that hits the news (or has much HR involvement). Some very contrasting views here and the debate on Twitter has been equally wide-ranging. Thanks Sarah, you make some very valid points but I still come back to whether we are in a world where people get equal pay for the same work, but that male dominated industries pay more than female dominated industries. The gender gap is a complicated beast. As they say, all people are equal but some are more equal than others. Michael – is the issue that men being the primary caregiver usually results in a loss off income because they are the main breadwinner? Zoe – choose your employer carefully is the message I think! Hi Richard. If my interpretation of your comment is right you have a good point. I think that one of the main reasons why more women than men are primary carers for children is because of the gender pay gap – especially to Sarah’s point that feminised industries and professions generally pay less than male oriented professions. Most couples with young children will make a rationale choice to have the lower income earner as primary carer. However this just further exacerbates the gender pay gap as when women take time out of the labour market their earnings will fall behind their male counterparts. Great topic and debate! Um, how are you reconciling your last comment with the general thrust of your post? If men are the primary breadwinners, doesn’t that give you some clue about the gender pay gap that you claim doesn’t exist. My first job after uni I resigned from because I found out they were paying my male peer 50% more than me ( we were field sales people – he did the left of the country, I did the right). In this job – my fifth since graduating – I’ve just produced a report for our Board demonstrating that we pay females of the same job grade an average of 10% less than males. We also hire fewer of them overall – both into the business and into senior positions. The gap exists, some of us are just slightly more aware of it than others – perhaps those of us who happen to have breasts & be the major breadwinner. Perhaps the question should be …Can we have it all today? Can females or males have “IT” all – career and children? It seems to me that the gender gap exists first in the relationship itself and is inevitably present in the workplace. Until women decide to have children and let their partner be the primary care giver AND the male partner decide to be a dad and be the primary care giver, then we will continue to have this debate. The biggest hurdle for women is to return to the workplace (full time or part time) after a few years away (children) without having to drop 2 or 3 ranks / pay grades. I don’t think there is enough male primary care givers returning to the workplace (part time or full time) after a few years away, to state that there is gender discrimination when returning to the workplace. OK, what I was saying in the post and probably haven’t articulated well is that the gender gap is often painted as being due to disctimination and bias. I don’t believe it is. There are lots of reasons why there is a gender gap and I stressed we need to look below the headlines but wholesale discrimination is not the reason. I stand by that. That said Lorna, you have obviously experienced the opposite first hand and continue to do so. I don’t know what industry you are in but that hasn’t been my experience of the corporate world athough I accept there are always exceptions and some companies will still have outdated approaches. I hope your board report is the catalyst for real change in your organisation.